Growing up, the only salad I ever ate consisted of a bottle of creamy cucumber salad dressing, a little iceberg lettuce, and sliced tomatoes. In that order. Seriously, it was all about the dressing. The lettuce and anything else were just vessels for transporting the dressing from plate to mouth. My take on salad has (thankfully) evolved, and it remains one of my all-time favorite things to eat. In recent years I’ve expanded my salad horizons, abandoning iceberg lettuce and occasionally replacing my treasured arugula, watercress, and assorted mixed greens with whole grains like wheat berries, bulgur, and quinoa. In addition to being delicious and good for you, whole grains have numerous benefits that make them a welcome addition to the cook’s repertoire. They’re simple and quick to prepare, and their nutty, neutral flavors allow them to pair nicely with a wide variety of ingredients. Fruits, vegetables, nuts, meats, and seafood can all be incorporated into salads made with whole grains. Quinoa is my go-to grain. I love its light and slightly chewy texture, and the fact that it can be on the table in about 20 minutes. 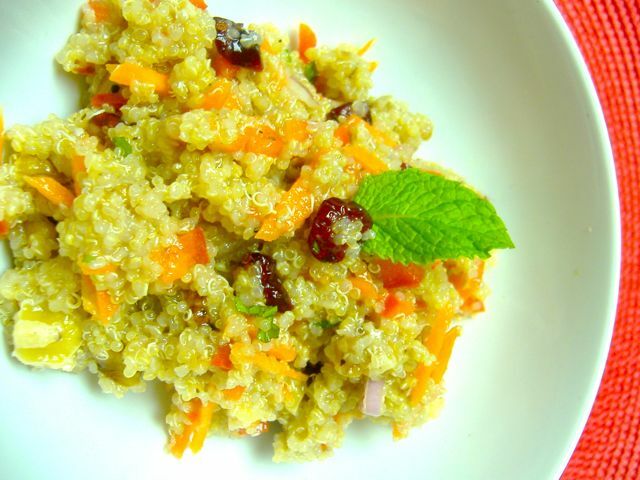 It doesn’t hurt that quinoa is considered a complete protein because it contains all nine essential amino acids, making it an excellent menu option for vegetarians. The real key to successfully cooking quinoa is to remember to rinse it thoroughly before cooking. Each tiny grain is coated with saponin, a filmy protective substance whose bitter flavor will overpower anything else. After rinsing, place one part quinoa and two parts liquid (water, stock, etc.) in a saucepot. Bring to a boil, reduce heat, cover, and simmer until the grain has absorbed most of the liquid and softens slightly. Making a quinoa salad with the cooked grain is a cinch: just toss a handful of your favorite things into the bowl along with the quinoa. (This works for other grains, too.) I like grated carrots, diced red bell pepper, shallots, dried cranberries, and walnuts, but you can vary it with your favorite vegetables, dried fruit, nuts, and shallots or onions. Finally, dress the whole thing in a mild vinaigrette, with salt and pepper to taste. I bet you’ll have a new favorite meal — in just minutes.